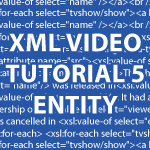 In this part of my XML video tutorial, I will cover how to use an entity. I’ll also show you how to combine XML, DTD and XSL files. You can use an entity to create shortcuts in your DTD files. You create personal codes like those built into XML like &lt; is replaced with <. Through using these codes you’ll be able to pull data either from within the DTD file, or from external files. All of the code follows the video. viewership of <xsl:value-of select="viewers"/> million people. hi bro i have no idea about c+ or c++ but a web said me if i learn c++ it will be easy for me to learn any other programming language like php easily, is it true ? suggest me please. and i also have seen that you are very expert in php, python, java, xml , jquery etc. i really want to be a programmer like you. In my opinion C++ would be a terrible first language. You could actually wreck your computer if you did something incorrect with C++. I think Python is the best first language, but you’ll eventually be limited by what you can do with Python if you want to program on the web. That still doesn’t mean you shouldn’t learn Python, because it is an easy language to learn and very powerful. Thanks Derek for explaining the topic so in detail. I have followed the above code step by step but getting the following error when viewed in firefox & IE. It can’t locate the TVSHOW1.xml file. You have to point to the location of that file on your computer. It would be different from mine. If you find that everything should work fine. I will check & let you know meanwhile when DTD is embeded inside xml. The entities(great) is showing up. But when DTD is defined in an external file it is giving error. When I am placing DTD inside xml file the entity(&great;) is displaying the description. but when it is displayed as an external file it is not. I will let you once its working. Is this happening with the code I supplied? 1. first of all you have awesome tutorials and thank you very much for sharing. 2. I think the content of TVSHOW5.ENT and TVSHOWSDIS.ENT should be the other way around. The naming of the files is incorrect ! Jeee it took me a while 🙂 In the xsl it is correct, the problem is on this page! The disclaimer should be in the file tvshowsdis.ent! It is NOT possible to open the XML in Firefox (on Linux/Ubuntu). Did not figure a way to make it work! Yes like it was written by gabikiwi on this page TVSHOW5.ENT and TVSHOWSDIS.ENT reference the wrong contents! Would you be kind to use the naming you make reference in the DTD ? tvshow5.ent and tvshow5dis.ent ? As always thanks a lot for your work Mr Banas! Eclipse does return the following when the tag description is hovered : The content of element type “description” must match “null”. The tag is underlined in red but that does not prevent the xsl transformation.